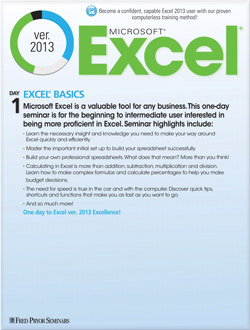 Microsoft® Excel® is a valuable tool for any business. This one-day seminar is for the beginning to intermediate user interested in being more proficient in Excel. This one-day seminar is for the beginning to intermediate user interested in being more proficient in Excel. Build your own professional spreadsheets. What does that mean? More than you think! Microsoft Excel is a valuable tool for any business. Excel can work data magic, but you don't have to be a programmer, expert or database wizard to use it. With some detailed know-how and best practice visuals, you will be able to track, report, store, analyze and organize data in a way that is easily shared and always right where you need it! Excel is a versatile and robust utility where you can calculate, organize, review, examine and present virtually any kind of data. It converts names, items, dates and numbers into real information you can use to make decisions for your business. You have the facts and figures, but just looking at the numbers is not enough. The key to unlocking the potential of all that raw info is in knowing how to manipulate it to determine what those numbers are really saying so you can make sound, effective and educated decisions for your organization. The first thing you see in Excel 2013 is that it has many new features, including a new start screen that will help you get to work faster. Explore Excel and customize your working environment so this program can work for you and utilize your work style to become more intuitive. Learn the seven steps to spreadsheet success. The key is to begin the right way, so you don’t spend time redoing or undoing work. Discover tips for planning ahead. A little pre-planning goes a long way when your spreadsheet needs to be built for maximum utility and usability. There are templates already there - should you use them? This component will help you determine whether you should create a new workbook from a template, or build one specific to your needs from the ground up. Formatting is an important step to make the data communicate in the simplest form. Learn to format your data so it’s easy for you, and others, to understand what your data is saying. Uncover some terrific time-savers that get every workbook off to a great start. Discover the tools to format your work so your data doesn’t just speak - it sings! With proper instruction, you will be able to optimize and improve your workbooks for further effectiveness. Learn from real life examples that actually apply to you, and broaden your understanding as you use it to create your own data masterpiece. Master Excel language and syntax to start building formulas like a pro. It’s tricky, but it can be done and you can do it! Who doesn’t want to work smarter and faster? Now you can with built-in formulas. We can show you the best practices for organizing data to help you with business decisions. Who is your best customer? Depending on the data, the answer may surprise you! Choosing the right chart every time is a learned skill we can help you with! Print only what you want: worksheets, charts and reports exactly the way you intend - the first time! We will show you how to design dynamic diagrams, and provide great guidelines to create assessable data. Learn how chart tools have become smarter - using Recommended Charts, your data display is clear and concise for anyone to understand. Familiarize yourself with shortcut menus and quick keys for efficiency and speed. You can uncover the power of your favorite shortcuts and will learn some new ones along the way! Demystify macros - what it can mean for your spreadsheet. Change your perspective: Use the various views Excel has to offer. Take advantage of time-savers like Flash Fill. Learn the power of the "Magic" ALT key!